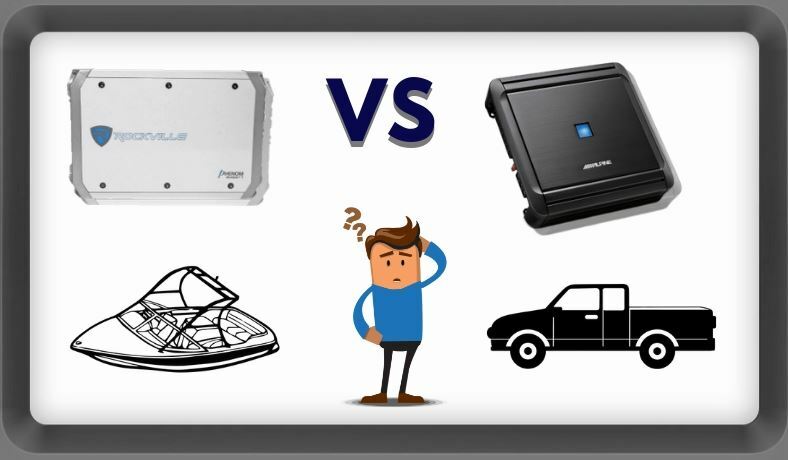 Home » Information » Marine Amp Vs Car Amp Differences – Can You Use A Marine Amp In Your Car Or Motorcyle? 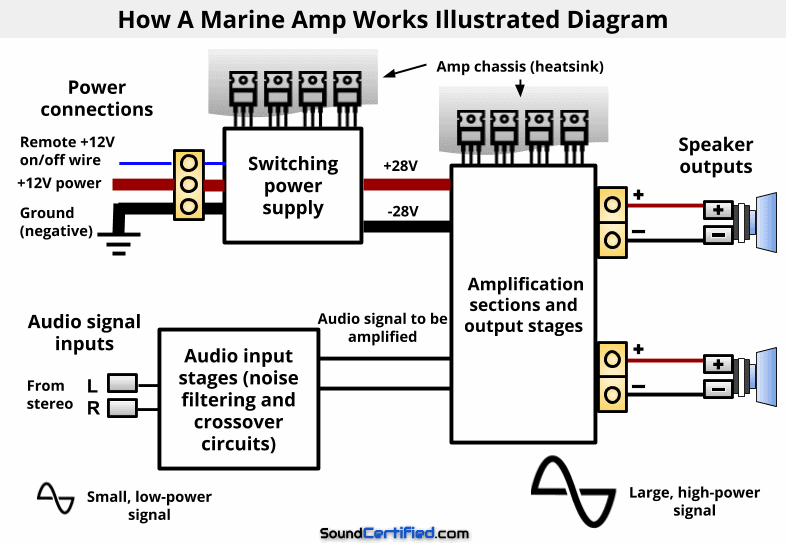 Are you wondering what makes a marine (boat) amp different from a car amp? Maybe you’re considering installing a marine amp in your car, truck, or motorcycle and want to learn more. Relax – I’ve got you covered. 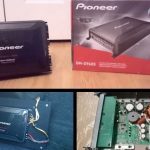 I’ll explain in great detail marine amp vs car amp differences and why they just might be an excellent choice for you. I’ve even opened up a marine amp to show you what’s inside. There’s some great news you’ll like also so read on! 2. 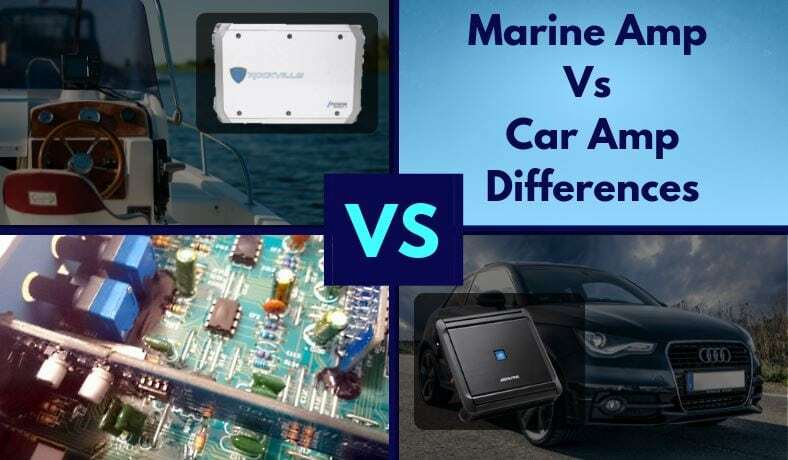 Marine amps vs car amps: What are the differences? 7. 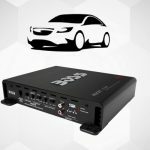 Can I install a marine amp in my car or motorcycle? Marine amps vs car amps: What are the differences? Already familiar with car amps? You’re in for some good news! As I’ll show you later, marine amps offer some cool features and installation possibilities that you might not be aware of. Basically, marine amps are car amplifiers with a some slight changes or more features. They’re otherwise nearly identical in most cases. The most important difference is their resistance to moisture and corrosion which I’ll cover in more detail below. Note: While marine amps may be sold as “waterproof” it’s more realistic to say they’re water-resistant. That’s because although they’re resistant to water and moisture they shouldn’t be submerged under water. Components like potentiometers (variable resistors, like for the gain & crossover controls) could still become trapped with water which will cause damage. 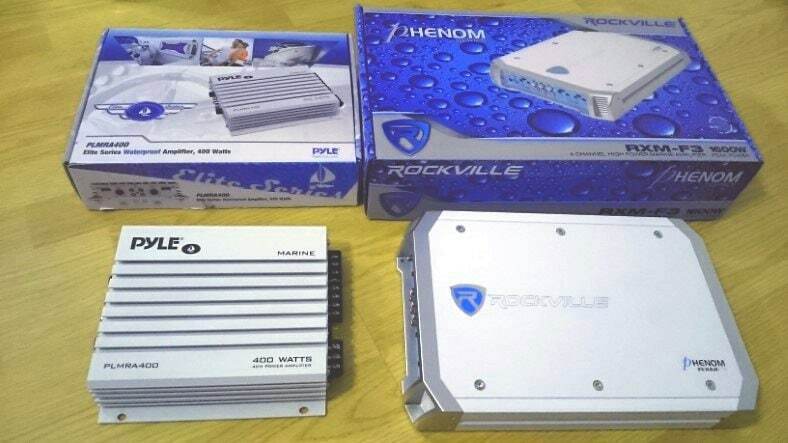 Pictured above are 2 popular marine amplifiers that are great examples. 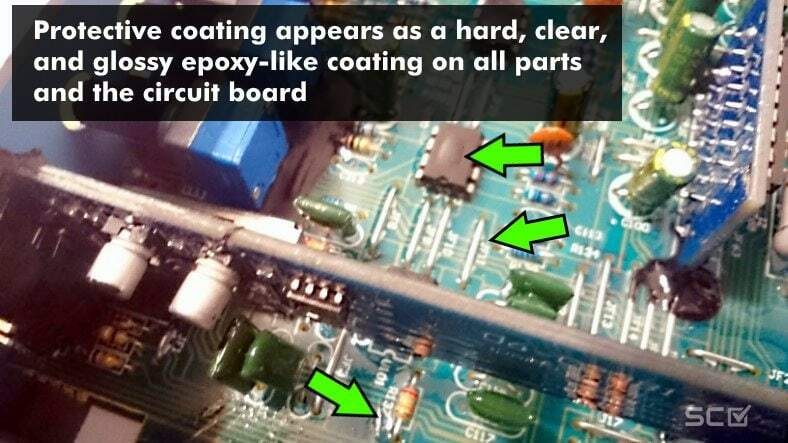 In both cases the printed circuit boards (PCBs) have a protective conformal coating applied. This is a hard, clear substance that resembles a thin layer of epoxy. Marine amps are often sold as a slightly different version of their car amp counterparts. The example Rockville RXM-F3 amp pictured above is available as the RXA-F1 with a different color & body and no conformal coating on the PCB. Both are typical high-power, bridgeable amps with 4 x 65W RMS power output, suitable for marine loudspeakers or a subwoofer system. Just like car amps, marine amps can be fully bridgeable and offer the same power output ratings or wiring options. An example of a marine amp’s circuit board with protective conformal coating. The coating is a hard, clear, epoxy-like coating that acts as a protective seal over the printed circuit board (PCB) and components. It protects the electronic parts, contacts, solder points, and more against corrosive elements in marine use. The issue is that unlike car, trucks, and other street vehicles, boats and marine vehicles are subject to much more difficult environments. They cause problems like corrosion, oxidation, and potentially can damage electronic parts inside an amplifier. While it’s possible to use a car amp in a boat it’s really not a great idea because of this. Marine amps are unique in that they offer this extra layer of protection in the form of a hard, clear, epoxy-like coating from the factory. This helps prevent corrosion and damage both to the amp’s parts but also electronic conductors and solder points. Internal view of the Rockville RXM-F3 4 channel marine amp. It’s basically the same in design as the car amp version. Marine amps have the same (or almost the same) internal design as their car amp counterparts. In fact if you open up two versions of the same amplifier they’re extremely likely to look almost exactly the same inside. Crossover controls on a typical marine amp. Input connectors (speaker-level or RCA jacks) direct the audio signal to the input stages. Crossover mode switches enable or disable full pass, low-pass, or high-pass functions. The gain (amplification) of the input signal is accessible here as well. Input stages work to block the common problem of “ground loop noise” and allow you to filter out bass or higher frequency sounds (as you like) for the type of system you have. Circuitry that provides extremely useful functions like speaker-level inputs, RCA jack inputs, crossovers, and bass boost are part of this section of components, too. A step-up switched mode power supply (SMPS), identical to that used in a car amp, creates higher voltages from the +12V supply of the battery. This boosts the +12V voltage to provide a higher-power signal that is sent to speaker outputs where high power output can be used. Without this, just like a marine radio or car stereo you’re limited to the amount of power that is produced from the +12V supply. That’s about 12W-18 watts or so which is pretty small. That’s far too little for driving speakers with good volume when you’re enjoying a day on the lake! Before loud music can be produced from your speakers the musical signal input has to be amplified. 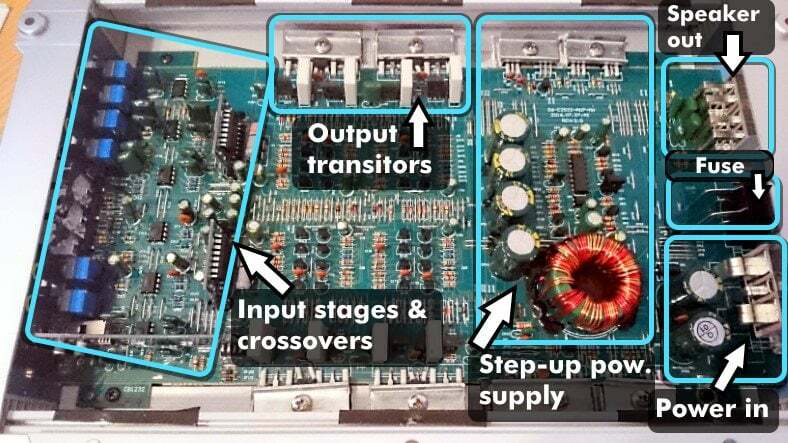 That’s the job of the amplification and output stages of an amp. 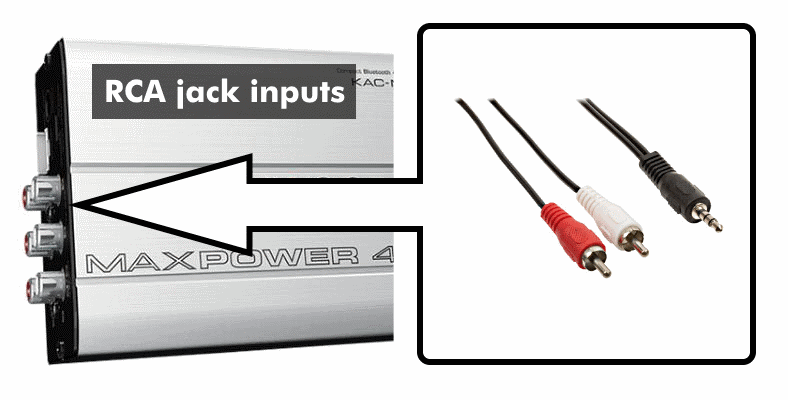 The small signal input (from the RCA jacks or speaker-level inputs) are used to create a specially balanced pair of signals that multiplied thanks to the higher voltages from the power supply. 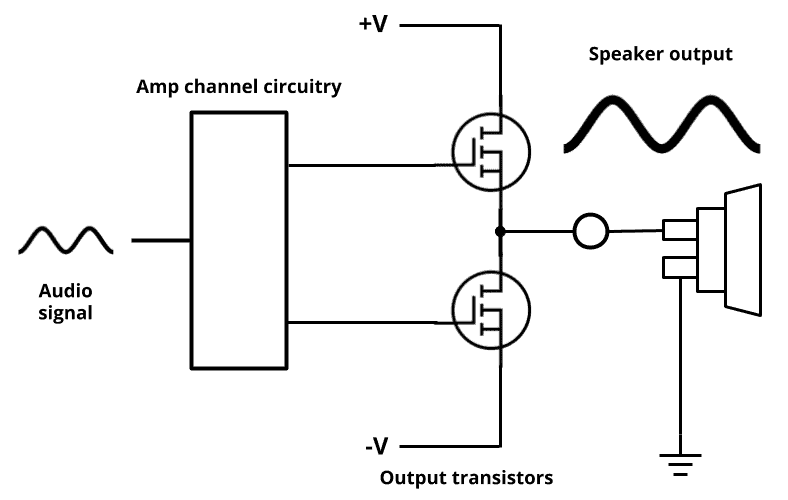 The high voltage connections attach to a set (usually one or more pairs) of high-current, high-power transistors which then drive the speaker output terminal. Marine amps often have some special features not offered with by car amps. Shown above are 2: A direct Bluetooth receiver function with control unit and a public announcement (PA) microphone feature. What’s interesting about boat amps is some of the neat features they offer. Many are simply not available for car amps. 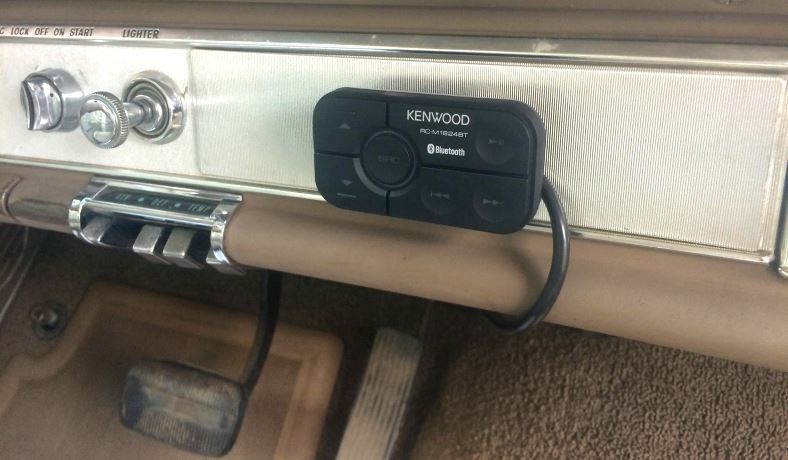 Because a marine stereo (or other outdoor vehicle) may not have a good stereo source available, some offer a direct Bluetooth connection for music streaming from your smart phone. In this case there’s no need for a marine radio source (head unit) as you can adjust the volume and control media direct using buttons on the controller. 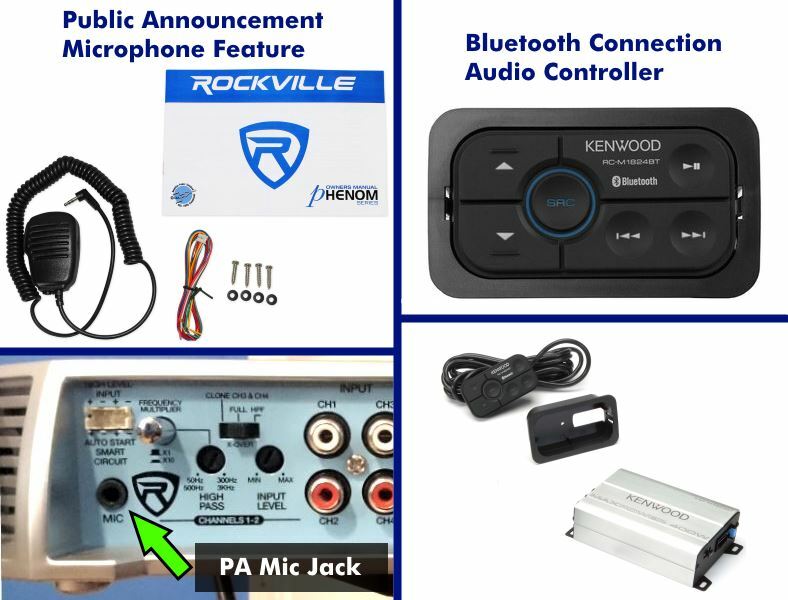 For loudspeaker public announcement (PA) functionality, some include a microphone which connects to the provided input jack. In this case the amp will allow microphone audio to override the music and drive the speakers with high-volume speech. It’s a feature sometimes used in boating near docks or anywhere on the water where it’s hard to yell to others long-distance. Auxiliary inputs aren’t an option for car amps. However you can do this with an inexpensive RCA to headphone adapter cable which will let you use any MP3 player or smart phone for the signal input. That’s a great way to get simple system without having to spend money on and install a stereo as well. A few models offer a USB +5V charging port which allows keeping your phone’s battery fully charged while in use. It’s a great feature when using a smart phone as your sound source. Can I install a marine amp in my car or motorcycle? 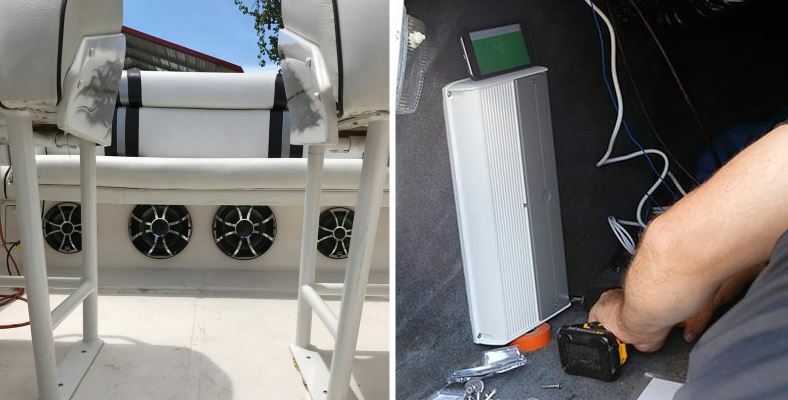 A marine amp installed for in-vehicle use & testing. Don’t hesitate to use a boat (marine) amp yourself if you’ve got one! Yes, you can install a marine amp in your car, truck, or motorcycle! As a matter of fact, they actually offer some great installation options you might not have otherwise! Marine amps offer some an excellent solution for some unique installations like classic cars. Rather than spend a ton of money for custom fabrication or metalwork you can use an amp for direct, easy-to-install sound that works great. They’re really aren’t any “cons” to worry about, aside from the cosmetic color and style. Additionally, when shopping that means it’s possible to have even more options and you can possibly find a great deal. How are marine amps installed? Marine amps have the same power and audio connections as car amps. However, as boats and yachts have unique wiring systems the audio signal source and remote-on wire sources may be different. Additionally, some boats have 2 or more batteries so wiring may need to be done a bit differently. One great feature is that if you’re using speaker-level inputs from a marine stereo some amps provide an auto-sensing feature to switch the amp on or off. It’s a great way to avoid the need for a remote-on wire. Although a standard car amp wiring kit is fine, I recommend a water-resistant fuseholder and extra length of ground wire as needed. Don’t forget the speakers! Tweeters help you get great sound you can enjoy in your boat or vehicle. Here’s a list of some of the best tweeters for the money.